I’m so happy to eventually introduce you to this recipe for bibim-guksu. If you have a big party but you don’t have a big budget, I recommend this recipe, with the condition that the people at the party love spicy food. I made these noodles for more than 30 people at Suzanne’s house in Rotterdam, when she hosted a meetup for me there. She made so many other Korean dishes to go with it, and people brought their own dishes, so we had plenty of food! Suzanne and Reinier have their own wesbite called Koreaanskoken, where they translate my recipes into Dutch. If you can read Dutch, go take a look! They also have a Maangchi Hyve. If you’re Dutch and you want to find other Dutch-speaking Korean food lovers, you can find them at those websites! “Ya ya ya! Let’s mix mix all!” : ) Susanne is mixing bibim-guksu for 30 people! The recipe is for 2 servings but you can use the same methods and techniques to prepare the dish for many more. Suzanne and I had fun at the meetup showing people how to serve so many guests. We had a huge amount of bibim-guksu! You can feed a lot of people on a skeleton budget! 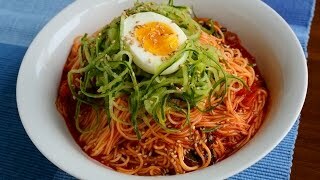 Please let me know if you have a bibim-guksu party with friends and family. Don’t forget to take a photo and send it to me. Thin noodles (somyeon), cucumber, egg, kimchi and kimchi juice, sugar, hot pepper paste, garlic, vinegar, sesame seeds, and sesame oil. Add ½ cup chopped kimchi, ⅓ cup kimchi juice, 1 clove of minced garlic, 1 ts sugar, ¼ cup hot pepper paste, 2 ts sesame oil, 1 or 2 ts vinegar, and 1 tbs roasted sesame seeds to a mixing bowl. Mix well with a wooden spoon. Hardboil an egg, cut it in half, and set it aside. Cut about ½ cup worth of cucumber into matchsticks and set aside. Add about 7 oz (200 grams) of noodles into a pot of boiling water. Stir them with a spoon to prevent them from sticking together. Close the lid. A few minutes later, they’ll start boiling over. Open the lid and stir the noodles. Cook a few minutes more with the lid open until they are cooked well. *tip: You can tell if they are cooked by tasting one or two. The noodles are very hot, so add a few noodles to a small bowl of cold water to cool them down before tasting. The noodles should be chewy and soft. When the noodles are cooked, rinse them in cold water couple of times, strain them, and set aside. The noodles will expand and lose their chewiness as time passes, so the noodles should always be cooked last in this recipe, and then eat right away. Put each portion of noodles on a serving plate and add the seasoning mix on top. Add cucumber and egg and serve. One change that I would suggest when making this for a big group is that instead of preparing each dish separately, you can mix all of the noodles, seasoning mix, and cucumber together in a big bowl. Then portion some out for each person, adding some egg on top. Posted on Saturday, January 28th, 2012 at 11:25 am. Last updated on March 23, 2019. Posted November 27th, 2018 at 2:38 am | Log in to reply. Hello ! I lived now in a very hot place ( Saudi Arabia) and this cold noodles are fantastic for a hot day! I don’t like hard boiled egg and I prepared fried tofu instead and went very delicious! And: my best friends here in KSA are Korean girls! They are like sisters for me! Posted February 25th, 2017 at 2:27 pm | Log in to reply. I didn’t fancy it cold, so I heated up the sauce, to pour over hot freshly cooked noodles then added the eggs and cucumber on top, both cold cold. Delicious! This recipe was originally posted on January 28, 2012 at 11:25 am by Maangchi. It was last updated on March 23, 2019. The video was watched 657,909 times on YouTube & has 5,162 likes!